Browsing articles in "Natures Resort Announcements"
So much has been going-on at Natures Resort, it’s hard to keep-up, without the latest edition of our Natures Tales Newsletter! Get all the latest about what’s been happening at your favorite nudist resort, plus a look-ahead at what we have planned. People always ask about our Guest Rooms at Natures Resort, and we’re happy to say (because we’re proud of them) that we have some new pictures to share. Now, you can see our guest rooms for yourself in our Photo Album. Can’t wait to visit? We can’t blame you! Reserve your guest room now, by contacting us today. How would you like to save 50% on camping when you’re not here at Natures Resort? Natures Resort proudly supports Passport America, where you can save at campgrounds across North America. Just click here for more information about Passport America. 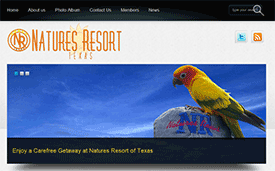 After a lot of planning and work over the past several months, we’re pleased to unveil our new Natures Resort logo & website! Please take a look around, and let us know what you think.